Prepared for Death? Not so much. But Preparing for Death? Maybe, just a little. I'm being honest. It's there, whether you verbalize it or not. When you are faced with a terminal diagnosis, many things will race through your mind, not the least of which is Am I Going to Die? And somewhere along the journey, usually after the first round of chemotherapy, the question transitions to Am I ready to Die? The side-effects may make you feel like you're just about there. Even then, Mom's answer was No! No, I'm not ready to give up yet. But am I thinking more about dying? Yes, that's truth. Impossible to deny. And so begins the dance, the preparing for death, but still embracing life. Along our journey, we've collected some beautiful anecdotes, stories, poems about this difficult transition from life into death. Some are humorous, some are contemplative, all spread a little light into an otherwise very dark subject. I've given credit to the author whenever possible. Should you want to share any of these, please do the same, and give credit to the authors. I no longer keep anything. I use crystal glasses every day. I’ll wear new clothes to go to the supermarket, if I feel like it. I don’t save my special perfume for special occasions, I use it whenever I want to. The words Someday and One Day are fading away from my dictionary. If it’s worth seeing, listening or doing, I want to see, listen or do it now. It’s these small things that I would regret not doing, if I knew my time had come. There was a woman who had been diagnosed with cancer and had been given three months to live. Her doctor told her to start making preparations to die (something we all should be doing all of the time). So she contacted her pastor and had him come to her house to discuss certain aspects of her final wishes. She told him which songs she wanted sung at the service, what scriptures she would like read, and what she wanted to be wearing. The woman also told her pastor that she wanted to be buried with her favorite Bible. The pastor stood looking at the woman not knowing quite what to say. "That shocks you, doesn't it?," the woman asked. The woman explained. 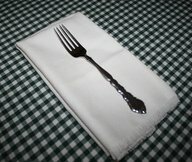 "In all my years of attending church socials and functions where food was involved (and let's be honest, food is an important part of any church event; spiritual or otherwise); my favorite part was when whoever was clearing away the dishes of the main course would lean over and say 'you can keep your fork.' It was my favorite part because I knew that something better was coming. When they told me to keep my fork, I knew that something great was about to be given to me. It wasn't Jell-O or pudding. It was cake or pie. Something with substance. So I just want people to see me there in that casket with a fork in my hand and I want them to wonder ''What's with the fork? Then I want you to tell them: 'Something better is coming so keep your fork, too.'" At the funeral people were walking by the woman's casket and they saw the pretty dress she was wearing and her favorite bible and the fork placed in her right hand. Over and over the pastor heard the question, "What's with the fork?" And over and over he smiled. If you are thinking you might get bored or tired after being in heaven for a while...don't worry! Try to imagine something with me. Imagine you are a little bird who lives in a tiny cage made of rusty metal. And inside your cage you have a food dish, and a little mirror, and a tiny perch to swing on. Then one day, some kind person takes your cage to a big, beautiful forest. The forest is splashed with sunlight. Proud, towering trees cover the hills and valleys as far as you can see. There are gushing waterfalls, and bushes drooping with purple berries, and fruit trees, and carpets of wild flowers, and a wide blue sky to fly in. And besides all these things, there are millions of other little birds, hopping from one green limb to another and eating their fill, and raising their little families, and singing their hearts out all through the day. Now, little bird, can you imagine wanting to stay in your cage? Can you imagine saying, "Oh please don't let me go. I will miss my cage, I will miss my little food dish with seeds in it. I will miss my plastic mirror and my tiny little perch. I might get bored in that big forest." And, one who can enjoy browsing old cemeteries…Some fascinating things on old tombstones! Jonathan Fiddle wentout of tune. He is not here, there’s only the pod..